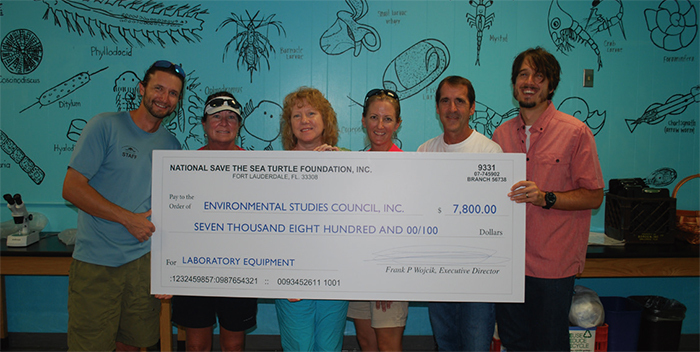 Jensen Beach’s Environmental Studies Center (ESC) received a gift of $7,800 from The National Save The Sea Turtle Foundation to add important equipment to their teaching laboratory. 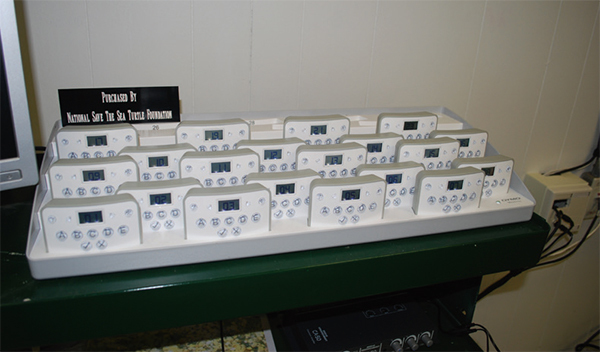 Twenty-five scanning microscopes and eighty Student Response System (SRS) ‘clickers’ are now available to the Center’s Staff to boost the quality of their educational programming for Martin County’s school children. Students attending the ESC participate in a field-oriented program of environmental studies designed to provide them with knowledge and appreciation of the Indian River Lagoon and local marine ecosystems. Instruction includes field investigations while seining in the lagoon, walking among the mangroves, or exploring the lagoon onboard our research vessel, the River Scout. Students spend part of the day in the field using equipment to measure and record turbidity, salinity, depth, wind speed, and temperature, examine samples of the lagoon bottom, and collect organisms and plankton to assess the health of the lagoon. The rest of their day is spent at the Environmental Studies Center campus in a lab setting, organizing, graphing, and drawing inferences from their investigations. Having the right equipment at hand promotes higher level thinking skills and student engagement. 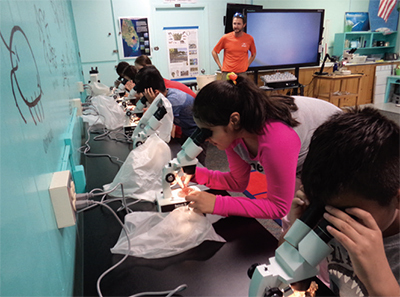 The microscopes bring the water to life by exposing the myriads of tiny organisms that thrive in the Lagoon’s water, and the SRSs are mobile digital devices that ensure every student participates in discussion, analysis, and drawing inferences throughout the lesson. SRSs also have an export feature to capture student comprehension, allowing the teacher to quickly differentiate the instruction. 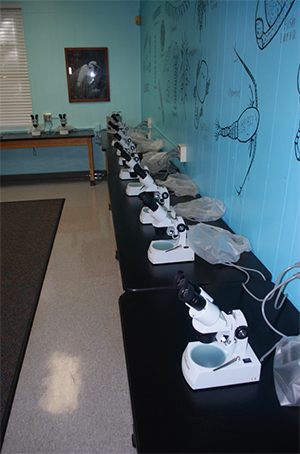 The National Save The Sea Turtle Foundation provided $7,800 to enhance Jensen Beach’s Environmental Studies Center’s student laboratory facilities. L-R Justin Speaks, Heather Arnold, Center Director Marilyn Gavitt, Michelle Fowler, Larry Wood, and Environmental Studies Council President Cody Mott.